Below are some of the happy endings we were able to create though our rescue. -of the 10 Sibes (9 were rescues) we've had over 40 years, she is the most affectionate one of all - though we got her for our, at the time, almost 10-year-old rescue boy, Dugan, who came to us with separation anxiety, he turned out to be a "dud for a bud" because he doesn't want to play with her! This is Togo and he turns 1 on April 1st. I adopted Togo when he was 6 months. I couldn’t ask for a better companion. Togo goes to doggy daycare twice a week where he plays with all his friends. He hangs out with his cousin Gizmo (Akita) and love to play together. We go to the dog park every weekend which he loves. Togo loves people. He wants to say hi to everyone and he gets along with all dogs. He sleeps in his bed every night when I say “it’s bed time Togo” although he does sneak into my bed at times. My whole family is absolutely in love with him. He has been great. He is awesome. I can’t say enough. We adopted Balto, formally known as Arden in January. In the short 2 months that we have had him, he has flourished into a handsome quirky amazing dog. 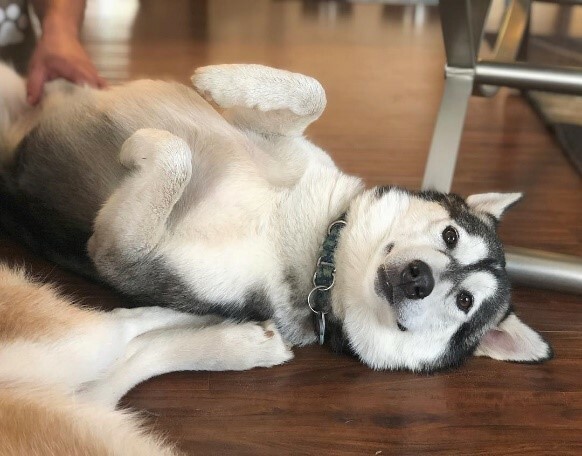 When we first got Balto he was very skinny and shy, but with some TLC and the help of his sister, Roxy, he has opened up and learned to trust. He has learned that he loves to play tug-of-war, doing somersaults on the couch, and cuddling! He has truly stolen our hearts and we can wait to watch him continue to grow. Phantom loves to smile, play and snuggle. He loves to bury his face into you and just plop over until he gets a good belly rub. He loves to walk for miles at a time and when its hot out, he loves his little pool! Adopting has taught us how to give Phantom a second home even when he was timid and unsure of us in the beginning. Him and Kimber are now inseparable and they are bringing in their new friend Bear into the pack also! Our advice for future adopters is to be patient and don’t forget that while your new friend is getting to know you, you also have to get to know them. We welcomed Zeke to his forever home Oct. 2017. He is the sweetest, most lovable, easy going and mischievous guy ever!!! We like to call him Edward Scissorpaws, because he has the longest legs ever and always into something with his big ol paws. He loves to dig holes and aggravate big sis Jade (that's what little brother do). But they are inseparable and partners in crime. Zeke has been the biggest blessing to our family and made himself right at home from day one. His favorite spot to sleep is in bed right between us. We make sure not to disturb him, for all he has been through he deserves the world and a big comfy bed!!! We love him to pieces as well as our princess Jade. Thank you Husky Haven of Florida for our bi-eyed beauty!!! Miss Diana joined our family the moment she stepped foot into our household. We agreed to foster Diana as a mangey puppy who was smelly and sore. As we watched her skin heal and her personality Blossom, it became very clear we were not going to be able to let this one go. Tears flowed every time I talked about potential adopters/applicants. Diana was already part of our family. Diana is extremely silly and vocal! She is OBSESSED with food and absolutely loves her furry friends. Digging is one of her favorite past times as is pulling all the stuffing out of her toys! She adores her fur brother and sister and even cuddles with her humans on occasion. She is one cool chick and we couldn’t have asked for a more perfect match. Adopting Diana made our home even more full of hair and dirt but more importantly love. She is the perfect pup to give gentle introductions to our fosters which allows us to continue with helping more pups! My advice to future adopters: robot vacuum, good brush, lots of walks, and plenty of car rides. Be ready for a wild adventure but one very well worth it. Ashton became part of our family in June 2017, and we could not be happier! He loves to go on runs, hangout at local breweries with us, and make new friends who will give him a belly rub :). This was our first experience adopting, and owning a husky. We are so grateful for how smoothly the process went. Husky Haven truly cares about placing their huskies with the right humans. It is easy to see this by how quickly Ashton has become the center of our world! We love him so much! It feels like he has always been part of our family. We would 100% recommend this organization to anyone looking to give a furever home to an amazing dog. Thank you Francia and Husky Haven for giving us our loving, sweet, and a little zoomie at times HUSKY!! !